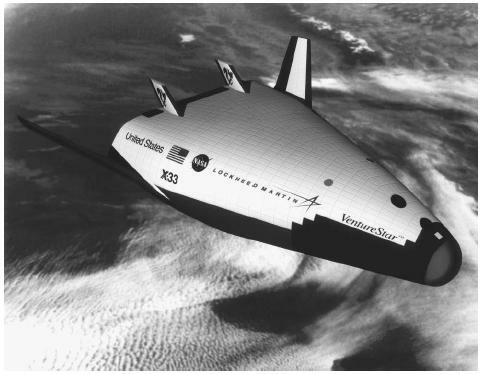 NASA selected the Lockheed-Martin Skunk Works to build and test the technology demonstrator VentureStar, as shown in this computer-generated concept. Skunk Works emerged from the cloak of secrecy that has shrouded it since the Cold War. scrapped in favor of the U-2. The CL-400 was to be a successor to the U-2, based on Johnson's design for a hydrogen-powered supersonic craft. However, the results satisfied neither Lockheed nor the Air Force, and the project was abandoned in October 1957. Lockheed Martin Aeronautics Company. < http://www.lmaeronautics.com/palmdale/ > (April 2, 2003).